Contact BatGuys at 781-974-4686 for animal removal services in the Greater Boston area. Scroll down to read local nuisance wildlife information for this area. 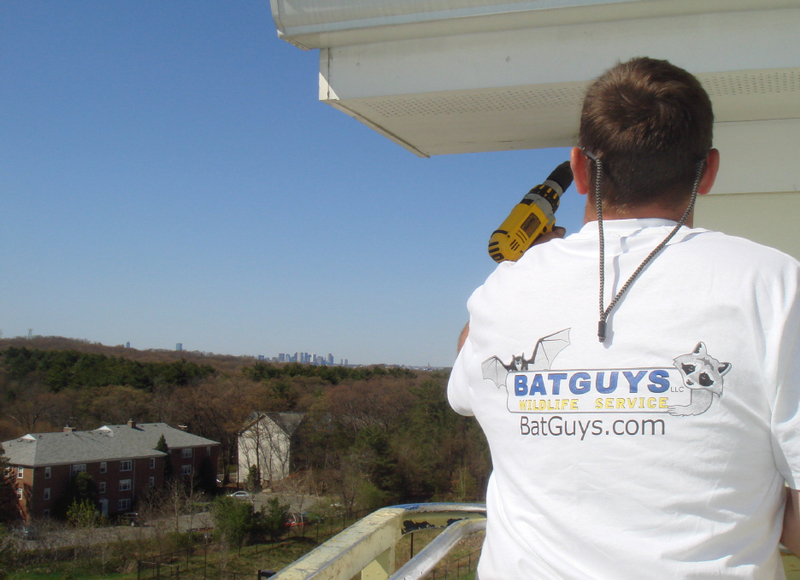 BatGuys is a nuisance wildlife control company servicing all of the Greater Boston area. We specialize in providing professional animal removal service for your nuisance wildlife pests. We are fully licensed by the Commonwealth of Massachusetts and provide permanent solutions to wildlife problems. We are not like traditional Boston exterminators in that we do not deal with or spray for insects. We are wildlife control operators, and our specialty is animal removal in Boston. 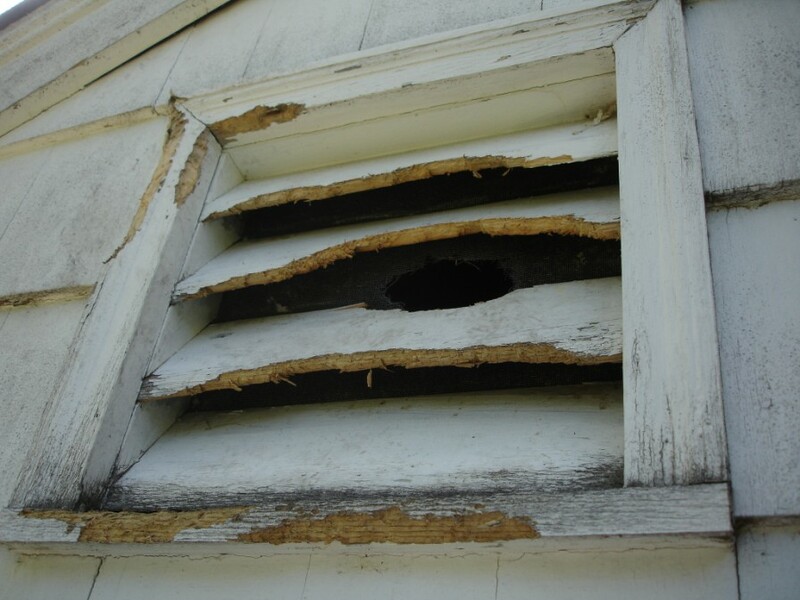 The most common situations that we deal with are bats in attics and roofs, squirrels in attics, skunks under porches/sheds and raccoons in chimneys and attics. Bats The Greater Boston area is home to a healthy population of Large Brown Bats. The old houses in the city give these bats plenty of places to reside. We typically find small colonies of these bats in the attics of these old houses throughout the city. Large Brown bats are year-round residents in the Boston area. In Late November these bats will go into hibernation. They hibernate in the walls and attics of old Colonial and Victorian-style houses. Most of our bat calls in the winter come from these large old houses in and around Boston. In the summer we find colonies of little brown bats in the suburbs to the North and West of the city. These little browns are migratory bats that arrive in Massachusetts in the spring as they migrate up the coast from the mid-Atlantic states. Little browns are usually found in large colonies. Some of the largest bat colonies that I have ever seen in the Boston area have been little brown bats. These bats generally leave in the fall to make their journey South when the cold weather arrives. Both species will establish colonies in roofs and attics of houses in Massachusetts. If you've had a bat in the house or you need help getting rid of bats we'd be glad to help. BatGuys is the leading bat control company in Massachusetts. If you're in need of bat removal in Boston you've come to the right place. We also provide professional attic cleanout services and Bat Guano Removal. Squirrels are found throughout the greater Boston area. These city squirrels can eat trash, nuts and just about anything else to survive in the city. I have seen gray squirrels chew holes in the lids of Rubbermaid trash barrels to get at the trash. In the warmer months these animals reside in nests at the tops of trees. When the cold weather arrives in the fall they seek refuge in the attics and soffits of houses. We see lots of squirrel infestations in the large colonial and Victorian houses throughout the city. Squirrels will find a weak spot in the roof line of a house and chew the area until the hole is large enough for them to get through. The toughest squirrel infestations that we have ever completed have been in the city. It is very difficult for squirrels to find suitable habitat in urban areas, so they don?t give up easily when you try to evict them. 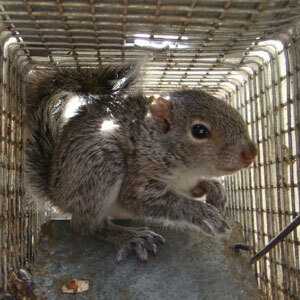 BatGuys provides expert squirrel removal in Boston and the surrounding towns. The suburbs to the West of the city have large populations of flying squirrels. Flying squirrels or "Flyers" as we call them are amazing animals. They are completely nocturnal and most people aren't even aware that they inhabit our area until they have an attic full of them. Visit this page for an in-depth look at a Massachusetts flying squirrel removal project and go here to see pictures of flying squirrels. 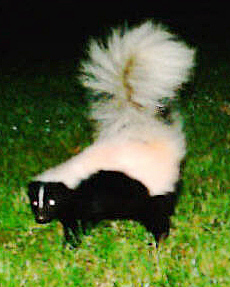 Skunks are found in great numbers throughout the city. It's when they burrow under decks, sheds and even houses that they become a nuisance. Some of the largest skunk removal projects we have ever completed have been in areas so heavily developed that you wouldn't think a skunk could survive. Its an odd feeling setting a skunk trap in the shadow of a skyscraper. The most common skunk problem we see in Boston is skunks under porches. Once a skunks gets under a porch they will dig a burrow down into the ground. This burrow can be anywhere from 1 to 8 feet. They spend the daylight hours dormant in this burrow. We specialize in skunk-proofing in Boston and also provide skunk odor removal services in the event that a skunk does let loose near your home. BatGuys provides skunk-trapping, skunk odor removal, skunk-proofing and skunk removal in Boston and all of its suburbs. 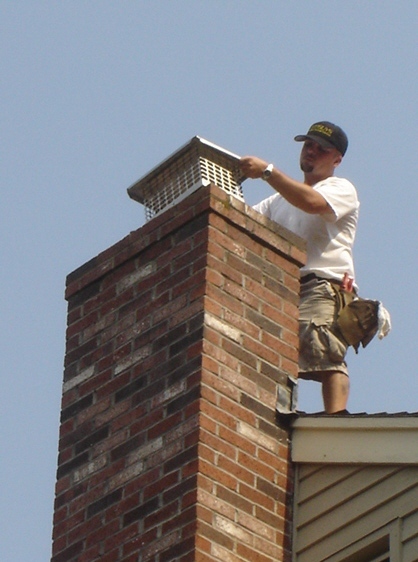 Boston area raccoons are very destructive and will break into unsecured soffits, attics, roof-vents and chimneys. Each spring we see adult female raccoons enter attics and chimneys in the Boston area to find a safe place to give birth to their young. This usually happens in early April and tapers off in early June. Every year I look forward to this period where we remove families of raccoons from these areas daily. It makes for interesting, exciting and dirty work. 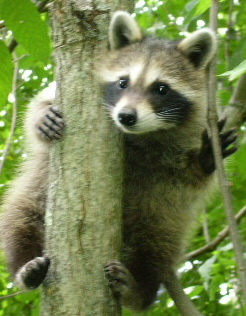 Visit this page to see a case-study of a Raccoon removal in Massachusetts. Certain parts of Boston are loaded with rats. These rats emerge from their dark hideouts when the sun goes down. BatGuys takes a much different approach to rat control than most local companies. We specialize in rat-proofing residential structures and small commercial buildings. We do not use rodenticides in any of our services. 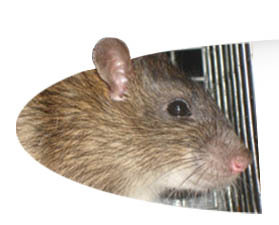 To learn more about our Boston Rat Removal Services please click the link. BatGuys provides expert mouse-proofing services for the greater Boston area. We use mechanical techniques to rid houses and buildings of mice infestations and can actually mouse-proof your home to ensure that mice are no longer able to gain access. Please visit our Massachusetts mice control page for more information. Say goodbye to traditional Pest Control services and annual contracts! Please use the telephone number on this page to contact BatGuys for wildlife removal services for any of the following Massachusetts cities and towns in the Greater Boston Area: Arlington, Bedford, Belmont, Beverly, Boston, Brookline, Burlington, Cambridge, Canton, Danvers, Dedham, Dover, Essex, Everett, Gloucester, Hamilton, Hingham, Hull, Lexington, Lincoln, Lynn, Lynnfield, Marblehead, Medford, Melrose, Milton, Needham, Newton, North Reading, Norwood, Peabody, Quincy, Reading, Revere, Rockport, Salem, Saugus, Somerville, Stoneham, Sudbury, Swampscott, Topsfield, Wakefield, Walpole, Waltham, Watertown, Wellesley, Weston, Westwood, Wilmington, Winchester, Winthrop, Woburn, and Wenham. BatGuys is operated by its owners. We provide fast, personalized service to our valued customers. We are polite and responsive, and take great pride in providing professional wildlife removal service to the Greater Boston area. Please note that we do not handle dog and cat issues. For all dog and cat issues call Boston Animal Control at 617-635-5348. Or visit our Massachusetts Animal Control Directory to find your town's Animal Control Department.